The physics of stars and stellar explosions can tell us about the origin of the elements that make up the Earth and ourselves, and represent virtual laboratories to study the fundamental properties of matter and gravity in extreme environments unachievable in terrestrial experiments. During the violent collapse and explosion of stars known as supernovae, the chemical elements that make up the materials found on Earth are created and forcefully expelled into space. 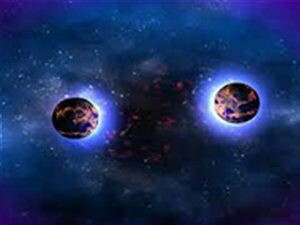 Stellar explosions, such as collisions between neutron stars and black holes, are also sources of gravitational waves that travel across space and can be detected from Earth. These waves test the physics of extreme gravity and probe the mysterious properties of the ultra-dense matter inside neutron stars. Likewise, neutrinos—lightweight particles that are present in droves throughout the universe but difficult to detect—have interesting properties that could reveal more about the fundamental makeup of the universe. However, this wealth of information cannot be interpreted properly without exascale computers. To analyze the signatures of stellar explosions captured by sophisticated telescopes and detectors, researchers need to create a virtual map key to understand the physical processes underlying their distant observations. Exascale computing will enable 3-D simulations of different types of stellar explosions that calculate the many complicated physical processes involved. 11/05/16 Hot material roils around a newly-born neutron star at the center of a core-collapse supernova.